In one of the largest cities in Canada, the Toronto Language School exudes global appeal. Students from all corners of the world meet for their language studies to learn English, develop cultural relationships and make friendships for life. Please note: Our schools offer a comprehensive student support service along with and all lessons being made up of a wide range of activities helping you to become a confident communicator. Our team of teachers give you all the support you need throughout your course and use a wide range of materials in their lessons to help you develop all aspects of your English language. This is a structured course that suits all levels and is an ideal way to develop your speaking, listening, reading and writing skills. Choosing the best exam to make you competitive on a global level is something we take very seriously and Eurocentres Canada is proud of the higher than average success rate our students achieve on exams. We take care to offer the best preparation for the most recognized international tests. Whether you intend to study at a post-secondary institution in Canada or the U.S. or take home a qualification to further your career, our experienced and knowledgeable staff can guide you and lead you to success. Our IELTS preparation course will help students develop key skills tested in the IELTS test. Students will be prepared for the test through a combination of language skills training and test practice. Each week is based on a relevant topic area, allowing students to build up experience of a range of topics covered in the test. Our knowledgeable staff will help you become familiar with the structure of the test as well as teach you the necessary skills, vocabulary, and grammar to succeed. Students can also get feedback and advice from our Exams Coordinator. The Business English course combines the best in academic Business knowledge with everyday business practice. A perfect blend of task-based learning and skill focus, the Elective also accommodates those interested in the TOEIC test, which is used to measure English in everyday work activities. Learn the all-important vocabulary and master the skills necessary to achieve a high score on all components of the TOEIC test (Reading & Listening/Writing & Speaking). Our instructors will guide you according to your priorities in a class which improves English for professional purposes. The Intensive Business Course consists of 20 core lessons per week plus five lessons per week of Business English. I had an excellent experience at school. In just two months of course it was possible to remember how to speak, write and read. This preparation made me reach a higher grade than I had hoped for in IELTS. The teachers are competent and hard-working and the school is well located. I loved everything at school, teachers, classmates, strategies, everything was perfect! The location was good, the service, the staff, I enjoyed a lot my time. I studied at Eurocentres Toronto for three weeks in the summer and it was an amazing experience. I took the general lessons and the exam preparation course, which was very helpful as I took Toefl when I came back to Spain. Joshua, Anna, Courtney and Byron were amazing teachers! The lessons were very interesting, useful and sometimes funny. This has definitely been the best English course I've ever taken, I enjoyed it a lot. I'm very glad that I chose Eurocentres Toronto, as I had the opportunity to meet awesome people from all around the world. It was one of the best experiences of my life! I studied English at Eurocentres for 6 months. I learned a lot here. Grammar, speaking, listening, reading, writing... Most classes were very interesting and useful. I can say that Eurocentres provides all students(at least me) with good environment to study. All teachers and all staff always tried to help me, if I needed any help. My English skill has improved during the time I was in Eurocentres, I was grateful to Eurocentres. I had an amazing and useful experience here. It is so worth to study English in Eurocentres that I want to introduce my friends. I am a student of Eurocentre. I am studying ILETS. I like teacher Ityka. her class is always funny. we can learn English in a relaxed atmosphere. Also everyone have opportunity to speak and gave us feedbacks which can improve our speaking listening skill and increase our vocabulary In the same time. She take care of everyone, try to find our weakness.For every student she gives suggestions. She is very caring, She always tries to help. Eurocentre Toronto has a particular and unique way to get us involved in the learning process. When I arrived in Toronto, my first impression about the institution was overwhelming and filled with such high expectations. I came here for improving my skills on English Language as well as getting ready for IELTS test, Academic and General Training. With my teachers’ help I could achieve my primary goal, being enrolled on strictly IELTS classes with John and Anna at the beginning. Then I could move toward to CAE class, where Joshua taught me how to master English Language in a Bilingual mode as an ESL student. So far, everything has been an enriching experience, wonderful academic environment as well, encouraging me each every day to do my best in order to achieve my goals for immigrating to Canada and being enrolled at University for my second Masters degree. As a professional, I couldn't be more satisfied regarding my results at all time I have spent here. I would like to say a big Thank you to all the Teachers, and staff for all their support and confidence put on me. It has been an amazing journey so far. I studied at Eurocentres Toronto for 10 weeks in 2016, and it was an amazing experience. One of my goals was to practice my English skills and to recover the fluency that I had lost as a result of years without speaking English. I also wanted to prepare myself and take the IELTS exam to apply for a College admission in Toronto. Today I can proudly say that going to Eurocentres Toronto was the right choice, because not only did I achieve my goals, but I was also able to meet a lot of people from all around the world, make new friends and have an incredible life experience. The classes are really good, dynamic, and provide many different activities and exercises to challenge the students day after day. I really like how you can choose your schedule to better suit your needs, such as grammar, fluency, and many other classes. The teachers and staff are amazing, always willing to help and making sure you are doing your best to improve, and I'm really grateful for that. Thank you so much, Eurocentres Toronto! 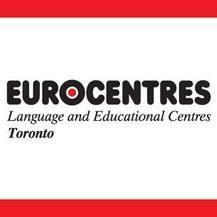 Eurocentres Toronto is an amazing school that I had the oportunity to study for a month! All the teachers were always very friendly and attentive with the students! I really liked the school because they use different methods of teaching, in a way that learning english was always fun! If I could choose again, I would certainly choose Eurocentres! I met awesome friends and teachers that I will never forget!